Tshara Gardner hugs her daughter Adebisi Agunbiade in this May 2014 Herald file photo after the girl was attacked by a dog in Killeen on Feb. 15, 2014. The scars on the girls back are from the dog attack. 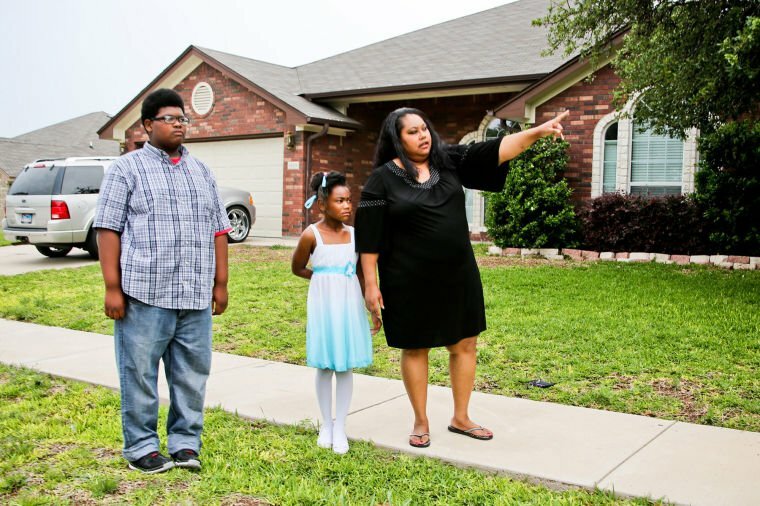 Adjuwon Agunbiade, 12, left, his sister, Adebisi, 7, and mom, Tshara Gardner, talk about the day in February when a dog attacked and dragged Adebisi down the sidewalk in their neighborhood in this May 2014 Herald photo. 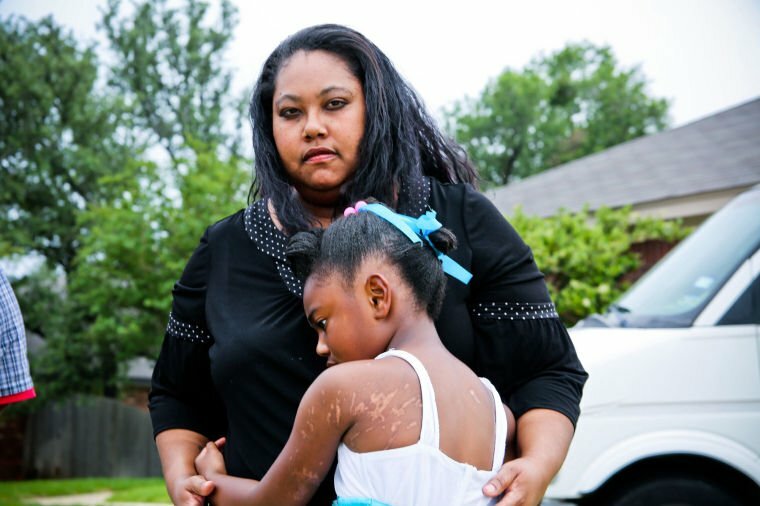 Although the 11-year-old Union Grove student has healed from nearly losing her arm in a dog attack five years ago, the scar serves as a constant reminder of both the physical and emotional trauma of the day, according to her mother Tshara Gardner. Gardner would like to see stricter standards for dog owners pertaining to the safety of the community. Adebisi was 6 years old when she was attacked by a shepherd-malinois mix while playing outside the home of a family friend Feb. 12, 2014. When her 12-year-old brother, Adejuwon, heard her screams and saw the dog dragging her down the street, he ran to her rescue. They struggled to get free from the dog and run home, but the dog managed to attack Adebisi several more times — and bite the arm of her 5-year-old brother, Av’ry, before they made it to safety, according to a previous Herald article. The dog also attacked Gardner’s 13-year-old daughter Ademaya before it was shot and killed by a Killeen police officer. As a result of the attack, at least four children were diagnosed with severe PTSD, Gardner said. And after two surgeries, Adebisi still bears permanent scars on her left arm and battles ongoing issues, the mother said. A separate incident weeks later in 2014 left another family bereaved by a dog attack in Killeen. An 18-year-old man and an 8-year-old girl were walking home from the Iduma playground with a 2-year-old boy their family was babysitting, when a dog described as a large bull mastiff, ran out of the garage of a home near the intersection of Pennington and Mildred avenues. Both children were transported to Carl R. Darnall Army Medical Center, where the 8-year-old girl was hospitalized, and 2-year-old Raymane Camari Robinson Jr. was pronounced dead March 1, 2014. Since the owner of the mastiff was not home and the dog had no prior history of attacks or aggression, charges were not filed by the city or the county. An open records request from the Herald to the city of Killeen’s Municipal Court revealed the 66-year-old woman who was moving the dog when it broke free received a misdemeanor citation for “animal at large” and was fined $164. Texas forbids any city to pass breed specific dog legislation, so the city’s “vicious dog ordinance” is the only legislation currently addressing dog attacks. The ordinance states no dog deemed dangerous will be allowed within the city limits of Killeen. A year after the attack, Gardner remembers pulling up to Harker Heights High School for a track meet and seeing two Doberman pinschers behind a chain-link fence that was not even as tall as them. Gardner said she has heard of and seen tickets being given for lawns that aren’t properly maintained, and would like similar vigilance paid to keeping fences for animals in good condition. Additionally, she would like to educate the public on how to care for their animals in a way that is respectful of the safety of those around them. Gardner said that since her family has had time to heal from the attack, the family of nine would like to get a pet dog soon. Is there a way to give my information to her? I am a dog trainer with Copilot Academy and would love to offer her a discount on training or help when they do decide to get a dog.